I’m in Zhenjiang at the moment. Readers will be forgiven if they have no idea where that is. Neither did I till I had to come here and decided to look it up on a map. It’s on the Yangtze River, between Nanjing and Shanghai. As far as I can make out, its main claim to historical fame is that it lies at the point of juncture of the Yangtze and the Grand Canal as the latter wends its way northwards to Beijing from Hangzhou. But I am not here to visit the city’s historic sites, of which – as in most places in China – there are very few left and what there is left is being turned into a made-over tourist spot. I am here to discuss with the management of the largest industrial zones how we could assist them to make their factories greener. As part of the discussions, we were taken to visit a couple of factories which had already taken some steps to reduce their environmental impacts. One of them was a huge – ginormous – paper factory. We were first taken to see the paper-making line, which was absolutely gigantic – the biggest in the world, we were proudly informed. Just to give the reader an idea, the rolls of paper which come off the end of the line for further processing each weigh 130 tonnes. After trying to take in this mind-boggling piece of equipment, we were whisked off to the wastewater treatment plant, part of which has a reverse osmosis line – as part of their greening efforts, the factory recycles much of its wastewater after thoroughly cleaning it and then polishing it with reverse osmosis. We were invited to taste the water coming out of the line, which I did, gingerly, half expecting to keel over. 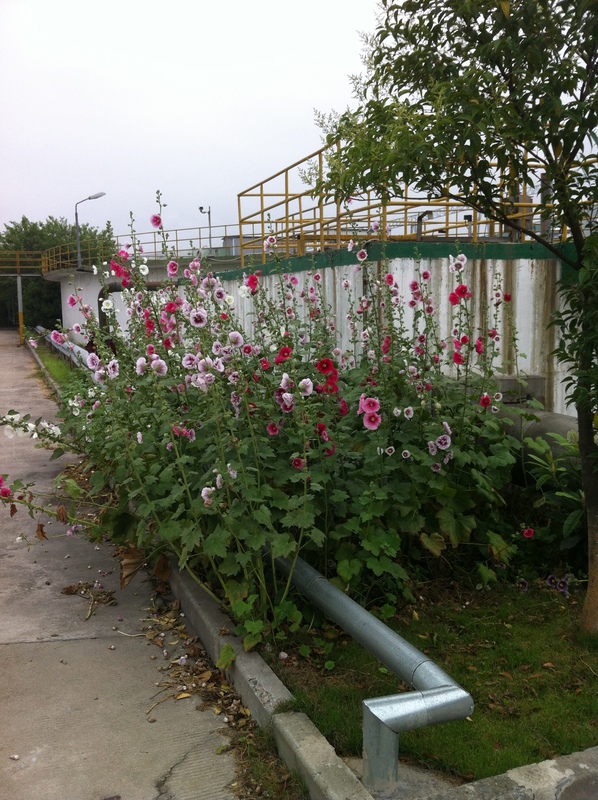 But I survived, and no doubt exhilarated by this close brush with death, I found these hollyhocks, which greeted us at the exit of the building, quite magnificent (you will notice part of the wastewater treatment plant behind them). As I exclaimed over them and took photos, a French consultant who was with us asked me what they were called in English. I told him and then asked for their name in French. Rose trémière, he replied. Rose trémière … We stood there admiring the flowers and wondering idly where the name came from. Later that evening, I looked it up. It’s a corruption of the name Rose d’Outremer, the rose from overseas. It seems that it was imported into Europe from the Middle East some time in the 1500s, perhaps after the last Crusades. But at least part of its DNA comes from China, where there are paintings of the flower from the 9th Century. As for the English name, it’s from Middle English holihoc: holi holy + hoc mallow. 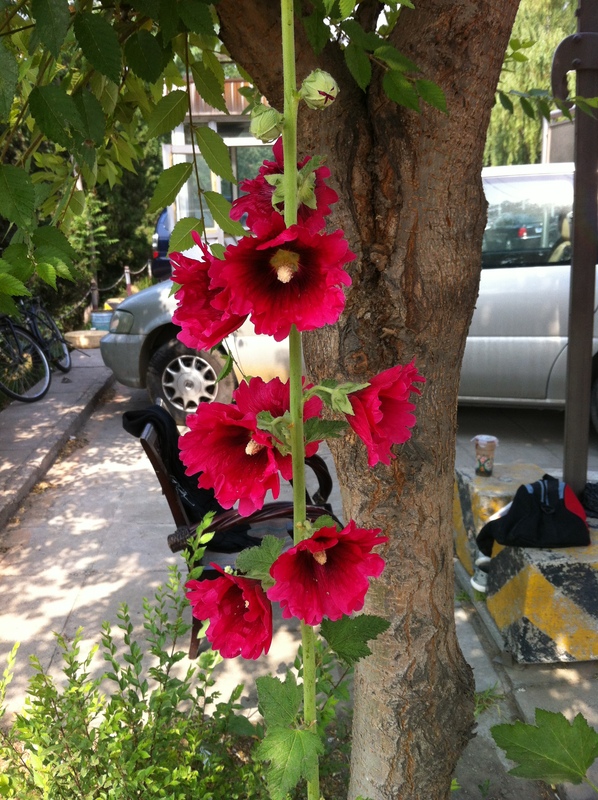 The day after I posted this, and back in Beijing, I came across this lone hollyhock on my way to work. It was sheltering under a tree next to my piece of canal. Fate.